Socrates and students engaged in the dialectical method. Dialectic was the weapon of choice for my favorite Western philosopher, Socrates. While he did not invent it, he certainly popularized it, and thus it is widely known as “the Socratic method.” In short, it is a method of critical dialoguing, where the emphasis is placed on the skillful use of probing questions in order to discover objective truths. Awakeness and ego enjoy an inverse relationship to the openness of dialectic. Awakeness loves it to the same degree that ego hates it, both for the same reason, which is its efficiency in unveiling truth for the participants. 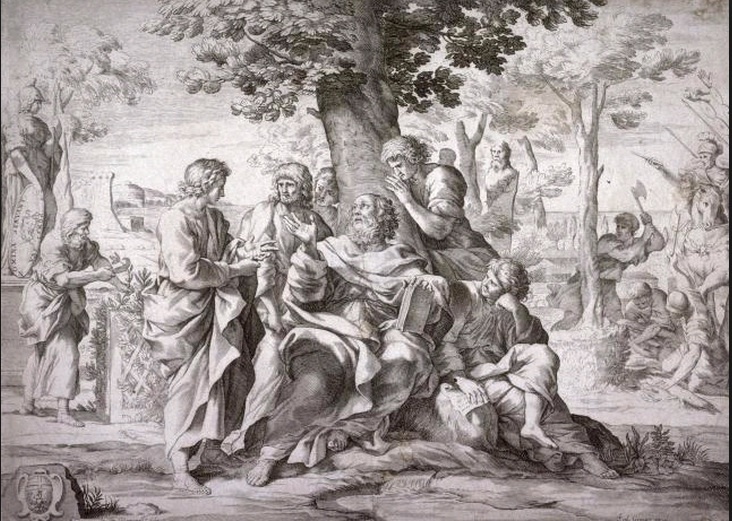 In the autumn of 2010, when The Living Method first began to assemble itself, I knew little more about Socrates than that he was ancient Greek philosopher who made the state angry enough that they forced him to drink poisonous hemlock as a means of execution. I was not schooled in Western philosophy beyond the American Transcendentalists of the nineteenth century, and I was not broadly read even there. So you can imagine my surprise (and egoic delight) when an early client with a degree in philosophy stated in a book review that “Fred Davis is the Socrates of Nonduality.” I immediately dove into early Greek philosophy and unearthed what became something of a new passion. I was also stunned to discover that the Socratic method was the foundation of what I was already using, in blessed innocence and ignorance, to wake people up. It was the bedrock upon which the process I later christened “The Living Method of Spiritual Awakening” was built. A number of seekers and teachers did not like my use of the term “method.” Socrates, I believe, would have liked it a lot. If it’s predictable, it’s a method even if it’s not a formal one. When I used to do Awakening Sessions, they chiefly consisted of long bouts of Q&A paired with mind-expanding experiments and stories that could help a client experientially recognize their True Nature during the course of the session. I had time to gently allow Awakeness to noticeably unfold–if it did. If it didn’t, I’d pull out the heavy guns. But a whole lot of people woke up laughing. And he was right. Some people do. And to some extent it is badgering. But it’s coming from my heart, not my head, and it’s all to help you get where you’ve asked me to take you. If gentler, kinder doesn’t work, well then…try this! It takes what it takes until it takes. I try hard to do my job well, even though the results are never mine to claim. It’s what happens here. This is a very sharp teaching. It’s not for everybody, I know that. But for those who are ready, I know of nothing that brings people face to face with truth more quickly or consistently. So it’s worth my putting my head on the chopping block, which is what I do meeting after meeting. I am all in with every hand. Again, that’s simply what happens here. The bottom line is I know going in that if I help someone wake up, they won’t care how we got there. I also know that if I don’t help them wake up right now, then I may never have the opportunity to help them again. So I push. Hard, if necessary. In my (Awakeness) experience as a localized human being, the dedicated role-playing as a servant of love is far more important than either praise or damnation. This unit is being used in a unique way, and awakenings have been happening around it several times a week, every week, for years now. But nobody said it was routine; no one ever said it was easy–not for you, not for me. So forgive me if step on your toes–it’s not always fun on my end either, but it’s not my job to give you comfort, but rather to offer you truth. And ultimately, the Truth leads to comfort. Not ego comfort, but the True comfort of seeing how absolutely limitless and loved we really are. Gratefulness and appreciation just arose…..